It is with deep sadness that we announce the passing of our daughter, sister and friend, Lana Frankow, on Thursday, November 29th, 2018. Lana was born in January 1964 to Ed and Elaine Frankow. She received her education at Centennial Park School in North Battleford, SK and later at John Chisholm School in Moose Jaw, SK. 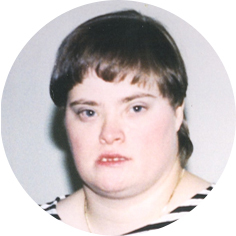 Lana spent the majority of her adult life as a client at Diversified Services. Lana had a zest for life and a love of music. It was not uncommon to find Lana singing and dancing to her favourite songs. She enjoyed spending time with family and friends and had an infectious giggle that could fill a room. Lana especially enjoyed spending her summers camping and fishing at Lake of the Prairies with her parents. She will be lovingly remembered by her parents, Ed and Elaine Frankow; her sisters: Kim (Barry) Greenwald, Rhonda (Lyle) Meena, and Dayna (Robert) Blanchette. She was a very special aunt and will be forever missed by her nieces and nephews: Meah, Mitch, Deiter, Carly, Laine, Leah, and Tyler. She also leaves to mourn numerous aunts, uncles, and cousins. The family wishes to extend a heartfelt thank you to all the wonderful staff on Raphael Wing at Providence Place for the special care that they provided for Lana. A private memorial service will be held, followed by a celebration of life at a later date. In lieu of flowers or donations, we ask that you take time to share a smile or a hug with the ones you love. Lana’s kind spirit and unconditional love are her legacy and will never be forgotten. But most of all –Real love! May you all find inner peace knowing Lana is watching over you. Ed & Elaine deepest sympathy on the loss of you’re daughter. My sincerest condolences. May the Lord richly bless you and provide peace and comfort during your period of bereavement. Ed & Elaine I am so sorry for your loss of Lana. I will always remember her as my neighbor from across the street. My sincere condolences to you Ed and Elaine in the passing of your daughter Lana. Dana and Kim, my deepest condolences to you and your families on the passing of your sister, Lana. From the obituary, it sounds like this special woman will be dearly missed by all of you. Take care. Sorry to hear about the passing of your special daughter Lana. You are in our thoughts and prayers. Blessings from Ron and Carole.